← Lottie and Dottie Sow Sunflowers. Well I’ve had a very busy day today. No, not down the allotment, or working, but baking. We do go through a huge amount of cake in our house because the kids and Mark have packed lunches. So usually once a week I end up baking enough cakes to hopefully last us through the week. I tend to make a variety of sizes and flavours. So today I have made the following: A white loaf (in the bread machine), which I know is a bit of a cheat, but at least I know exactly what’s gone into it. A loaf tends to last us 2, possibly 3 days. Sometimes we can get through one loaf in a day. The bread machine is great as you put the ingredients in, switch it on, and then go out. When you come back, it’s done and the house smells fabulous. I also made a Strawberry upside down cake. This will make 8 slices so will do us puddings for 2 nights. The strawberries are ones from my allotment that I froze. Make sure you defrost them before you put cake mixture on top as they give off a lot of juice. I also made some vanilla flavoured small cakes and cup cakes. This was from Mary Berry’s all in one recipe. These will be decorated with icing and small marshmallows. The kids love them, and so do the grown ups. And finally something that we’re going to have for breakfast on Saturday morning. 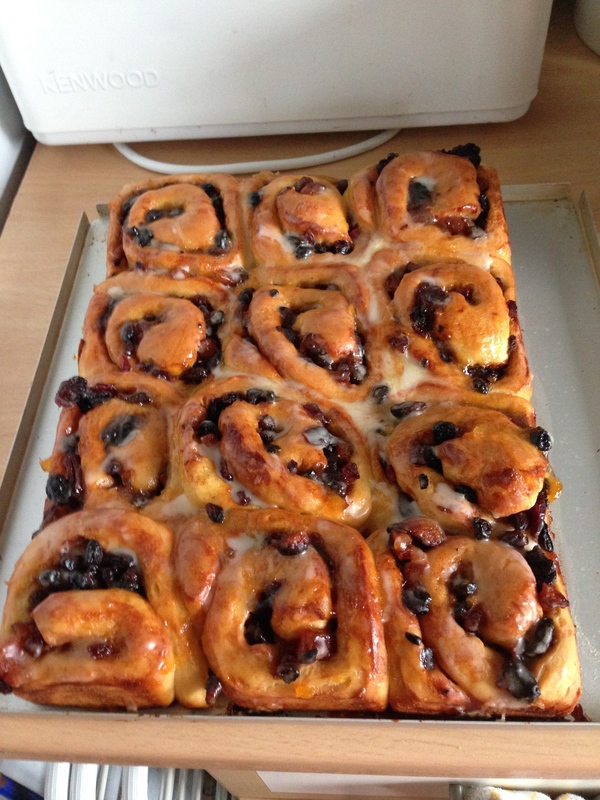 Now I’ve never made these before, they do take a little while, but they’re definitely worth it, Chelsea Buns. I used the Paul Hollywood recipe, which was very easy to follow. I made 12 buns rather than 10, but I don’t think it mattered. I didn’t kneed by hand, but used the dough hook in my mixer (for the first time) which is brilliant! They look good, I hope they taste good. What do you think? Chelsea Buns with orange icing, yummy!! This entry was posted in Uncategorized and tagged Chelsea buns, claire's allotment, Great Briti, Mary Berry, Paul Hollywood. Bookmark the permalink. 8 Responses to Busy day baking, yummy!! Those Belgian buns are really making my mouth water!!! They tasted as good as the looked. Would you believe that I have a batch of these in the oven whilst I’m reading your blog!!!! It was obviously the thing to do at the time. Handy hint is to make double quantities, then after rolling, put half in a bag in the freezer…. When you fancy a weekend treat, move to the fridge the night before, then slice and bake for 20mins! I’m on my second bread machine. I wore the first one out. It lasted 5 and a half years, and then gave up the ghost. I’ve had this one for about 5 years now, so I hope it lasts a good many years more. It’s great to put some bread on, go out and come back to beautifully smelling bread. The blueberry sponge sounds lovely.